This Creamy Chicken Noodle Soup gets it’s cream from evaporated milk. I know! Crazy right? But it won’t curdle and you can use the fat free stuff. Your gonna rethink that can of evaporated milk in your pantry! This is a Soup-er easy recipe to make. Comes together really quickly and guess what you use for the ‘cream’? A can of evaporated milk! Clever, clever! The beauty of this is that your soup will never curdle or get grainy like some cream soups do and as an added bonus store bought Rotisserie chicken or turkey work great! 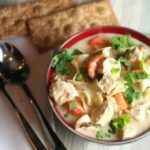 I’ve been making this Creamy Chicken Noodle soup for over 10 years! It’s my families fave and so easy to make! I was kinda surprised I had not posted it! Hey there’s a potato in my soup! Yup, potatoes and noodles…whats not to love! The potato gives it an almost chowder type consistency that makes for a hearty dinner. I use “No Yolk Egg Dumplings” for the noodles. They don’t get mushy and will hold up when you reheat for dinner the next day and lunch the day after that...the soup that keeps on giving! I have also made a Chicken Pot Pie Soup version of this recipe that uses cream and has cute little heart shaped puff pasty ! 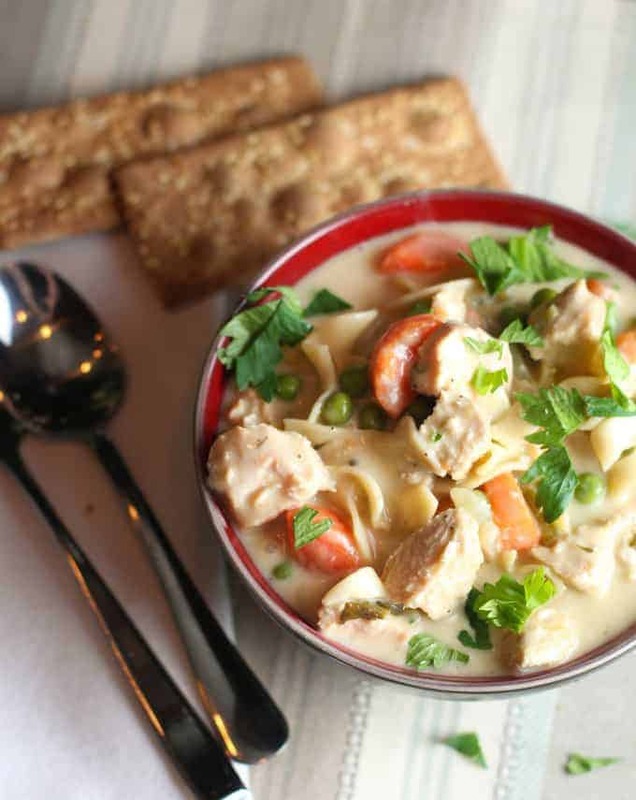 This Creamy Chicken Noodle Soup gets it's cream from evaporated milk. I know! Crazy right? But it won't curdle and you can use the fat free stuff. Your gonna rethink that can of evaporated milk in your pantry! Heat oil in Dutch oven or large soup pot. Add onion, carrot, celery and garlic. Saute 5 minutes. Sprinkle flour, oregano, thyme and poultry seasoning over vegetables; cook 1 minute. Stir in broth and potato. Bring to a boil and simmer 25 minutes or until potato is tender. Add chicken, milk, noodles and peas. Cook an additional 10 minutes or until noodles are tender.